This 1500 watt Toastmaster Electric Ceramic Griddle offers an affordable way to grill a few regular portions of breakfast eggs, pancakes, bacon and more, or meat, chicken and burgers. It's a healthier, energy-saving alternative to frying or firing up a regular sized grill on the range. The ceramic coating that Toastmaster have applied to the cooking surface makes for a tough, scratch resistant and easy-to-clean conductor of heat. It also gives off less heat into the kitchen environment than a regular grill, making a more pleasant environment to cook in. Style-wise it will complement any contemporary kitchen space. The compact design features an attractive black curved body with a granite-gray ceramic cooking surface. With a 19 inch by 10 inch ceramic hotplate, this electric griddle is more compact than some countertop grill units, but still has plenty of space for cooking eggs, pancakes, bacon, hash browns, meat, burgers and more. The temperature dial enables accurate selection of heat between 140 and 400 degrees Fahrenheit. The ceramic cooking plate is PTFE and PFOA free, and designed for easy cleaning. ​There's a slim drip tray mounted underneath the griddle in the center. Fats, oils and other liquid residues run off the angled cooking surface into the tray. Then it slides out from under the cooking surface for emptying and is dishwasher safe (in the top rack only) for easy cleaning. Some users found it filled up somewhat quickly with foods that had a lot of liquid or fat runoff during cooking, however. ​The curved black plastic surround and sides of this Toastmaster griddle are cool to the touch, and the AC power lead attached away at one end of the unit, well clear of any food and hot surfaces. It's a lightweight unit weighing less than 4 pounds, easily stowed away when not in use, with a removable temperature probe that slides out. Buyers appreciated the quality of the ceramic surface. It resisted scratching and peeling much better than other non-stick surfaces on griddles, and proved much easier to wipe down and clean. Most online reviews praised the even heat distribution and quick warm up time, finding it easy to cook with and versatile for cooking different types of hot food. 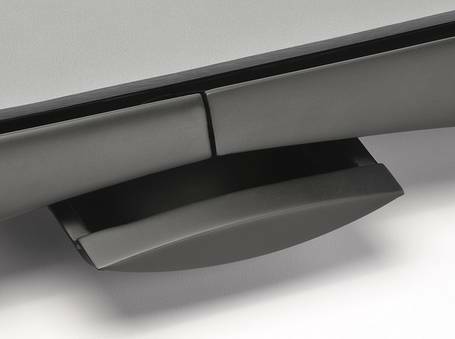 The slightly rough, gritty surface on this ceramic electric griddle made some users feel they were scraping it clean, and they would have preferred a smoother cooking surface. The lack of a deep enough drip tray meant this Toastmaster griddle was not as user-friendly as some buyers had hoped. They had to find alternate means of catching runoff from their cooking, or else empty it of hot liquids in a hurry. ​A couple of buyers found the overall dimensions too small to meet their grilling needs. Be sure you'll be able to fit all the food you want to griddle at one time into a 19 by 10 inch space. One reviewer had problems with the griddle burning bacon and other grilled food on the area of the plate around the heating element, and one or two others had to return their Toastmaster griddle after it stopped working altogether. There's a one year limited warranty from the manufacturer, in addition to any guarantee from the retailer. 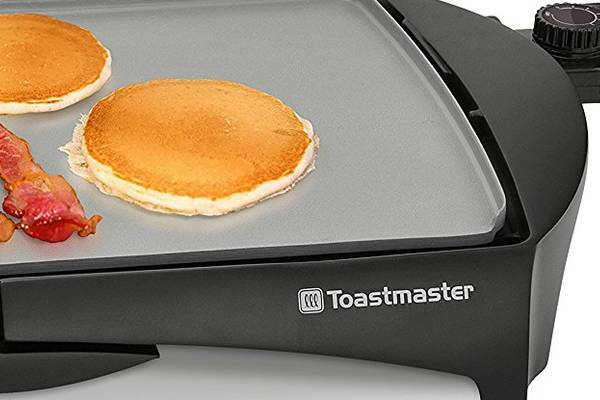 This Toastmaster griddle is, for its modest price, one of the best ceramic electric griddle options. Its high quality non stick coating won a lot of praise from reviewers and owners. The surface appears to be durable, quick to clean and reliable for many repeated uses. Users report it's versatile and able to cope with pancakes, meat, eggs and chicken at various temperatures. The ceramic griddle surface resists food sticking to it, and although burnt-on fat sometimes requires a scrape, it seems to be easy to shift without damaging the non-stick surface. For juicy or meaty grills, the drip tray on the Toastmaster electric griddle can soon fill up, and this may be an issue depending on the kinds of food you plan to grill. Another consideration is its compact size. It's great for not taking up your whole counter top, but ask yourself whether a 10-inch deep hotplate is enough space for the size of meal and portions you plan to prepare.